Talk about jumping in the deep end. Until a couple of days ago, we hadn’t taken Chuck The Truck off the tarmac, much less a gravel road. And certainly not through a sand dune. 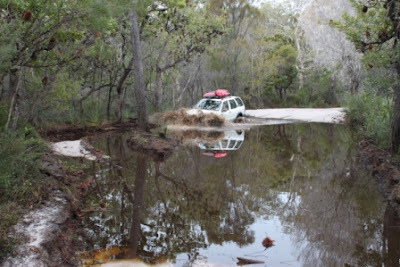 Fraser Island does that to you. It’s not like you’ve got much choice. 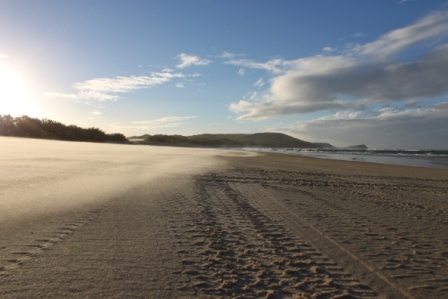 Fraser Island is the world’s largest sand dune, measuring some 120km in length and 20km in width. It’s also the greatest sandpit on earth for boys and their toys. I’d never seen anything like it. Vast stretches of open beach, as far as the eye can see, waves washing in on one side, sand cliffs eroded by the tide on the other, and you just go barreling straight up the middle. 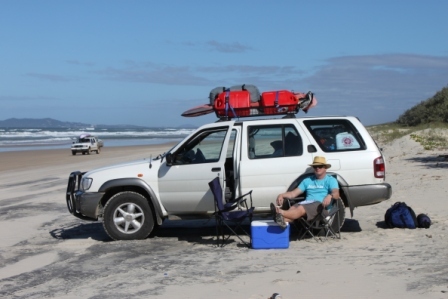 The beach is the main thoroughfare here on Fraser Island. Which is lucky, as there’s no roads. Unless you count boggy, sandy, inland tracks that until a couple of days ago I wouldn’t have thought you could walk down, let alone drive along. Let’s just say we’re no longer off-road virgins. This morning was a bit hair-raising though. I had an 11am appointment with Radio Live’s Weekend Variety Wireless with Wallace Chapman, standing in for the redoubtable Graeme Hill – a gig I’ve been doing for years, and love it. Anyway, there’s only one point on the whole island with phone reception, and it was a good 50km south of our campsite. So we started barreling down the beach towards radio reception when I realized the tide was nowhere near as far out as it should have been. Which was why we were the only vehicle on the beach. I wondered where everyone else was. We ended up wave-running down the beach, which is an extremely dodgy practice whereby you have to time your runs between each sweep of the tide, and hope you squeak through between the sea water and the cliff face before the next wave. We did, but not without a couple of broadsides from the tide. 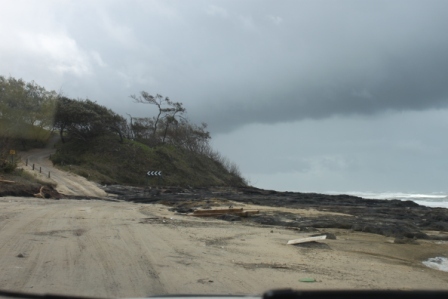 At one point, I had to stop and wait for a massive wave to finish breaking right over our truck, as I couldn’t see a thing. So much for not getting salt water on a vehicle. Oh well, there’s always car washes, right? I made it to air, anyhow. We spent the rest of the day happily rambling around the island’s tracks, visiting pristine fresh water lakes, of which Fraser Island has plenty. They’re called perched lakes, formed by rainwater and rising water table filtering through leaves from the rainforest, between the inland sand dunes. 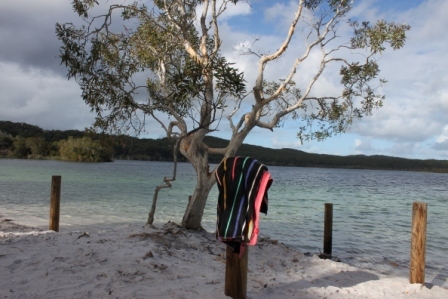 The best was Lake Mackenzie – white-sand beach, rainforest, and beautiful clear water. I went for a swim, but the girl chickened out. It’s still not that warm, despite the fact we’re now at 26 degrees south of the equator. So now we’ve crossed the Noosa River in a barge, driven up the Cooloola Way (basically a beach) to magnificent Rainbow Beach, with its multi-coloured sands, got another barge across to Fraser, and I’m now sitting in our tent next to our gas lantern writing this. Tomorrow we’ve got to retrace our steps to the barge at the southern point of Fraser to Inskip Point, before rejoining civilization and the highway north to Hervey Bay, Town of 1770, and Airlie Beach, where we’ll get a ferry to Whitehaven Island in the WhitSundays. We notched up 2000km today since leaving Sydney just under two weeks ago. I really wish I'd bought BP shares.